Established to make women feel safer and reduce the risk of sexual assault, women’s parking spaces can be found nationwide. These spots are usually in an area under closed-circuit surveillance and are wider and longer allowing women with children and strollers to have enough space to get out of their vehicles. You’ll recognize these as they tend to have hot pink outlines and are marked with the standard woman symbol. Critics say these spaces perpetuate gender stereotypes, but since they’re not yet mandated by law, anyone can park in these spots. 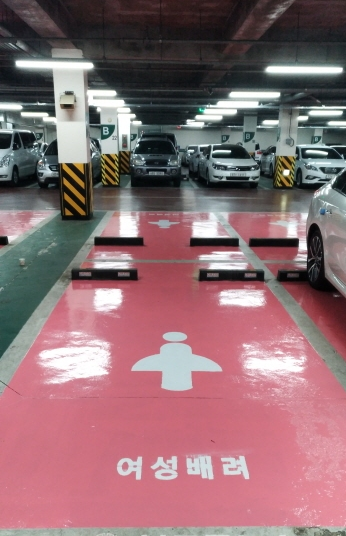 Shopping malls have embraced the “women only” parking space to promote their “women-friendly” image. 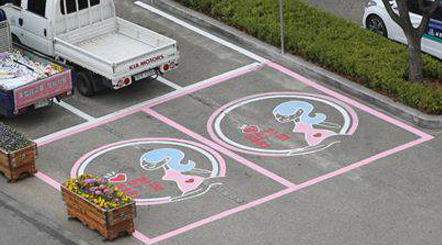 In some areas, women-only parking spaces are being converted into expectant mother parking spaces. These spaces marked in yellow are for elderly drivers, especially those who have mobility difficulties. Like the women’s first parking spots, these are close to entrances, making it easier for an elderly person to walk to their destination. 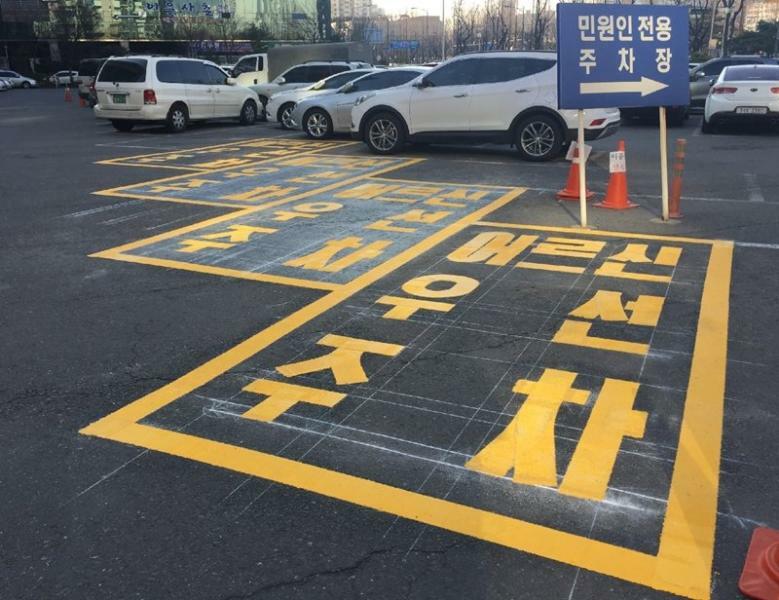 These spots, while necessary, are not easy to distinguish from other parking spaces, as they are marked with ‘어르신 우선 주차구역’ meaning “elderly parking space.” Recently, signs with an elderly person logo have gradually started to appear, but they vary by region. 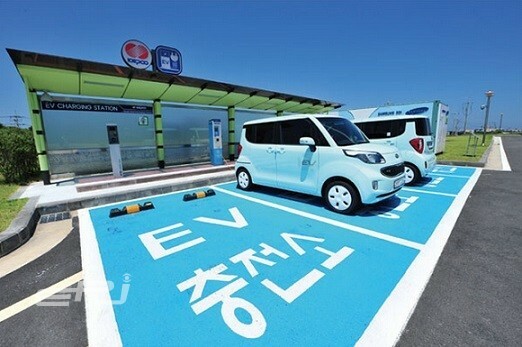 This type of space is increasing in many government office parking lots around South Korea. In the case of Gyeonggi Province, space is limited to women who are pregnant and within 6 months of giving birth. Criteria differs from district to district. Like a women’s priority parking lot, these parking spaces are wider than regular parking lots and are bordered with hot pink outlines and marked the pregnant woman logo. Technically, anyone can park in these spots. At present, there is only the establishment of an Expectant Mother Parking Space Act, and there is no punishment for who park in the place. Beware, just because anyone can park there now doesn’t mean you will be able to in the future. Many local governments and the national assembly are working to create legislation for these spots. In some areas, only people who have a pregnant women parking permit issued by a local government are allowed to park in these spaces. The rapidly increasing number of electric vehicles or plug-in hybrid vehicles has made parking spots of this nature more common. Usually marked in English as EV or an simple plug logo, parking in these spots could get you a fine as they are limited parking spots for recharging. The government is cracking down on illegal parking in these spaces. Parking space for military veterans, police or firefighters These spaces have only been in existence for a year, starting with the Yongsan-Gu office in Seoul, and are meant for those who served the country.